and establishment of systematic monitoring of wildlife and security incidents by community scouts. 1. 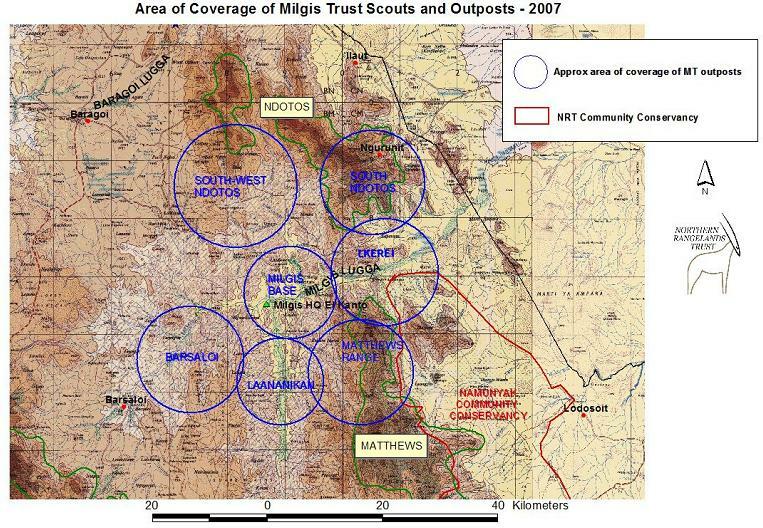 Purchase of radio communication equipment for Milgis Trust scouts, to enable effective communication between Milgis Trust outposts and the MT headquarters. 2. Recruitment and support of MT Manager to improve and facilitate community awareness and liaison. 3. Recruitment of 10 additional scouts (with support from Shikar Safari Club International) to boost scout numbers to 24, including 2 radio-operators. 4.Improved wildlife monitoring through systematic recording of daily wildlife observations from MT outposts in Occurrence Book at MT headquarters. 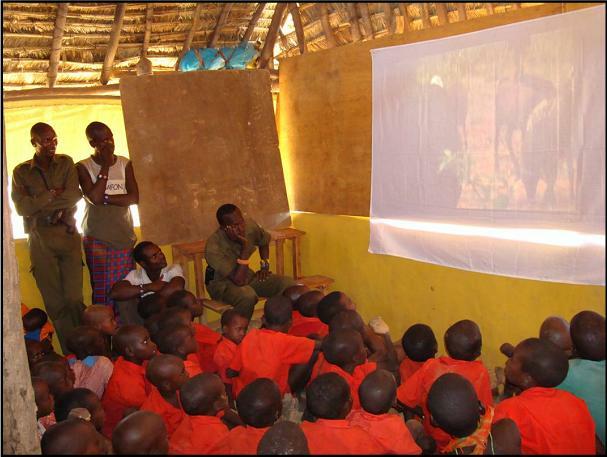 NRT provided technical support to the MT in community-based conservation, security and monitoring of wildlife. In February 2007, the NRT executive team (including Executive Director, Director of Operations, Community Manager and Research & Monitoring Coordinator) visited the MT headquarters at El Kanto to review and discuss the structure and conservation priorities of the MT. As a result of this meeting NRT was able to make recommendations on restructuring of the organization to improve community representation and decision making, and recommendations for more systematic reporting and recording of wildlife observations by community scouts. NRT also facilitated a donor visits to MT by Zoological Society of San Diego. when it is about to rain, and within two days rain has fallen in this area. As the Milgis dries up the elephants head back upstream (west and south) and up into the mountainous areas of the Matthews and Ndotos ranges. 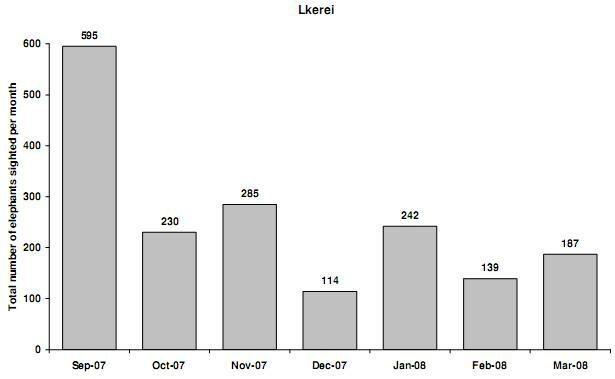 There has been good rainfall in most of the MT area since late 2006. 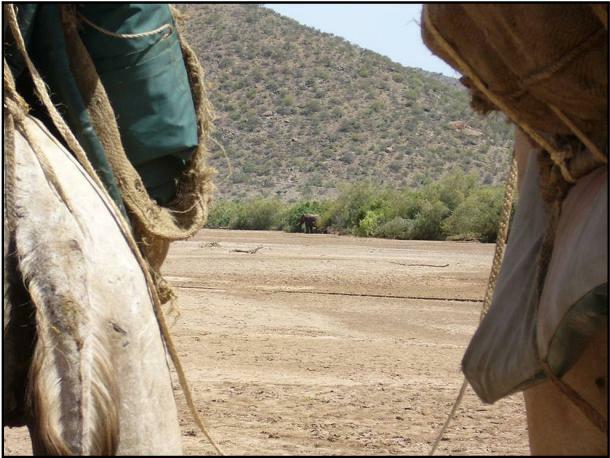 As a result surface and subsurface water has been plentiful in the luggas providing elephants with water. 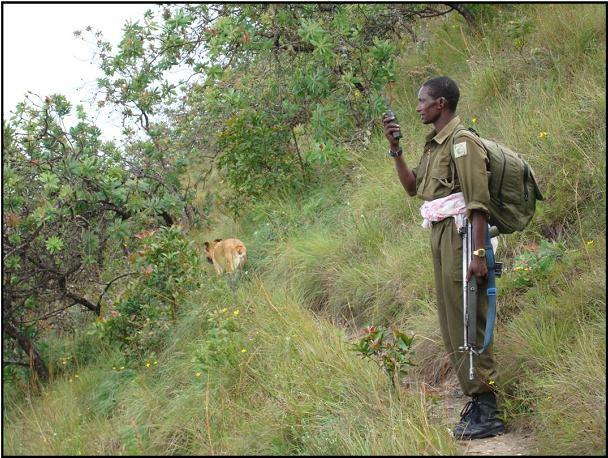 MT scouts provide daily reports of sightings of all wildlife and other incidents (security, poaching, fires etc.) 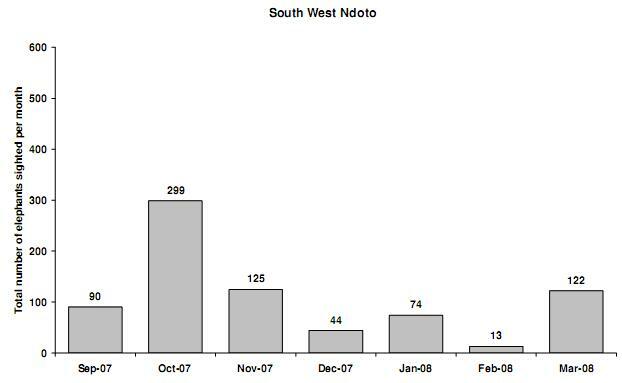 to Headquarters, this is recorded in an Occurrence Book and data summarised on a weekly and monthly basis (Appendix 1 shows total numbers of elephants sighted per week in each outpost area from September 2007 – March 2008). 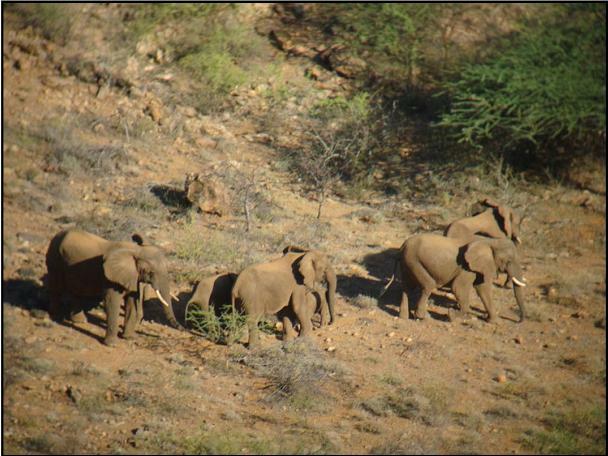 Observations of elephants by MT personnel suggest elephants are being sighted more frequently in the north and north-west of the Ndoto Mountains over the last two years. Scouts recently recruited in this area will be able to provide regular reports on wildlife in future. There was very little elephant conflict during 2007, only a few close encounters between people and elephants when elephants ventured close to settlements or dams. A Milgis Trust scout was chased by an elephant on 10th March 2008, however managed to escape with no injuries. 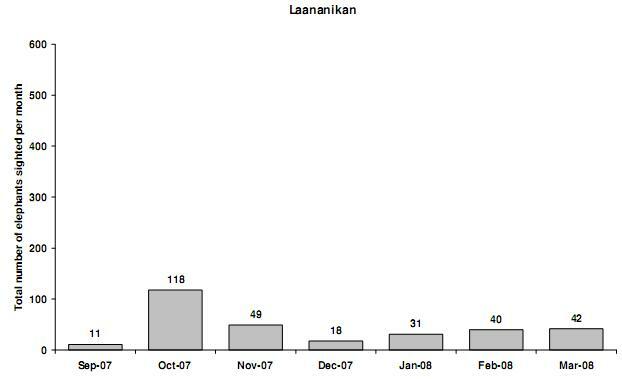 In 2008, MT introduced a monthly census of all wildlife, scouts record all wildlife sightings and tracks of key species along a 20 km transect. 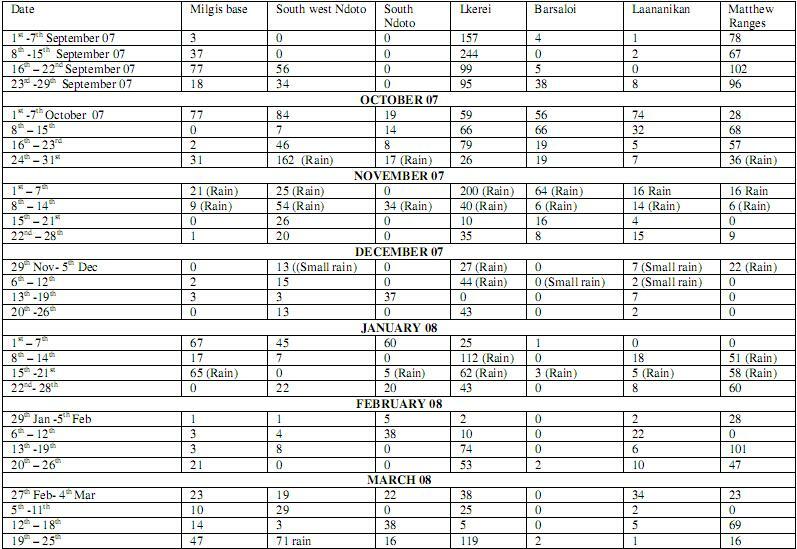 This is repeated each month and will provide information on wildlife trends in this area. Results have not yet been analysed but will provide long-term trends in wildlife abundance and possibly density estimates of wildlife in this area. 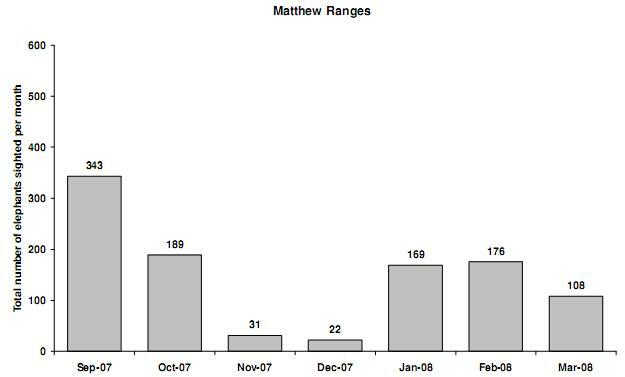 There was no elephant mortality reported by Milgis Trust scouts during 2007 or early 2008. 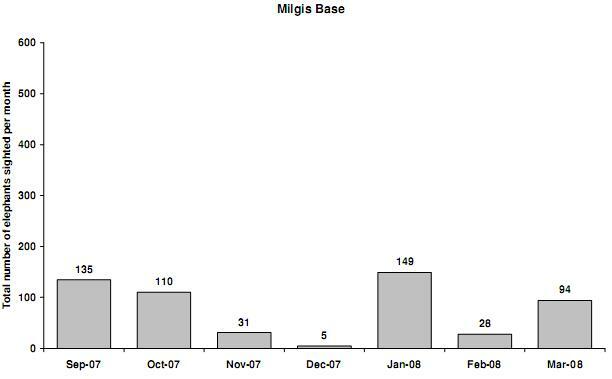 Milgis Trust scouts provide a dual role of security and community awareness/liaison. 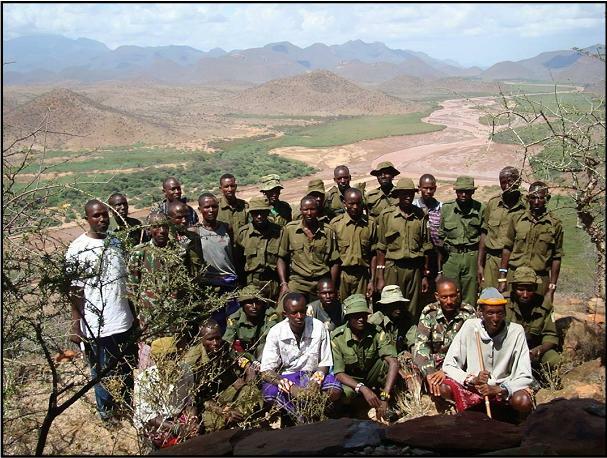 Scouts are widespread; recently MT scouts have been recruited in areas important for Grevy’s Zebra, particularly West and north-west of the MT headquarters towards Baragoi and El Barta. An important role played by scouts in the Matthews Range is to locate forest fires and help reduce this threat to wildlife and the unique forest found in these ranges. Other roles played by MT scouts are ensuring wells in dry river beds remain open and accessible for elephants and other wildlife and repairing these wells when they are destroyed/collapse as a result of elephant use; in some areas communities are closing these wells with thorn barricades to prevent wildlife accessing the water. corridor with large numbers of elephants moving east just prior to the rains (e.g. September 2007) and back west after the rain. High numbers of elephants were also seen in Matthews Ranges area, Milgis Base and South-West Ndotos. 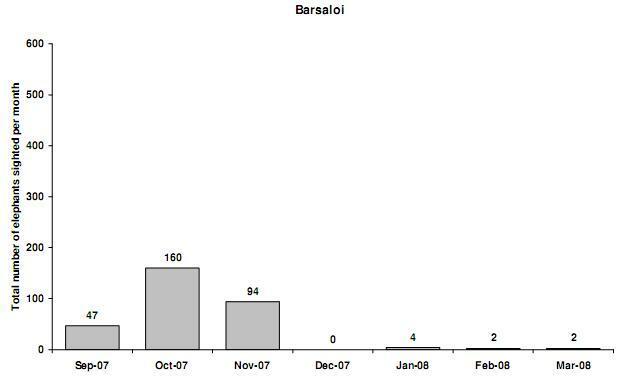 Elephants were only sighted in Barsaloi during wet months (late September – November 2007) and in relatively low numbers. 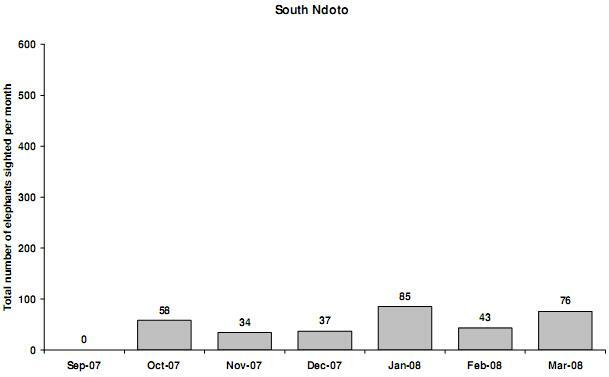 Elephants were sighted during most months in south Ndoto however in relatively lower numbers than other areas. Total expenditure of IEF funds (US$ 9,155) is shown in the table below.